Himeji City Zoo, located in Hyogo Prefecture, sits at the base of historic Himeji Castle. Himeji Castle is visited by more than one million people per year and is registered as a UNESCO World Heritage Site. Himeji Castle is beautiful and world class. 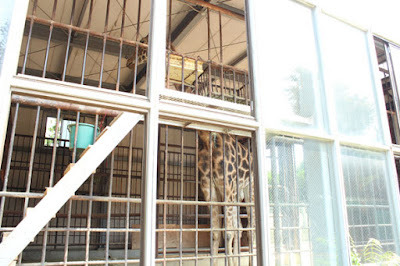 In sad contrast, Himeji City Zoo is neither beautiful nor world class. 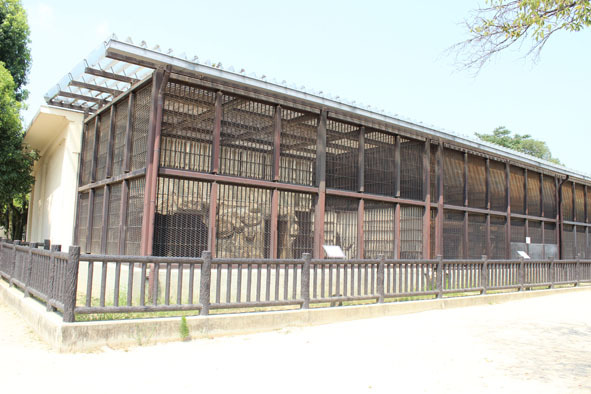 The old style and appearance of the exhibits at Himeji City Zoo leave the visitor with the impression that they have not changed in design since the zoo’s opening in 1951. 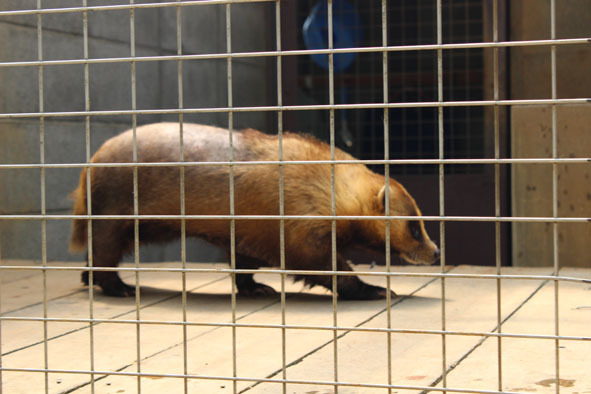 Many of the exhibits appear very small in relation to the resident animals, and most do not have even a slight resemblance to a natural environment. 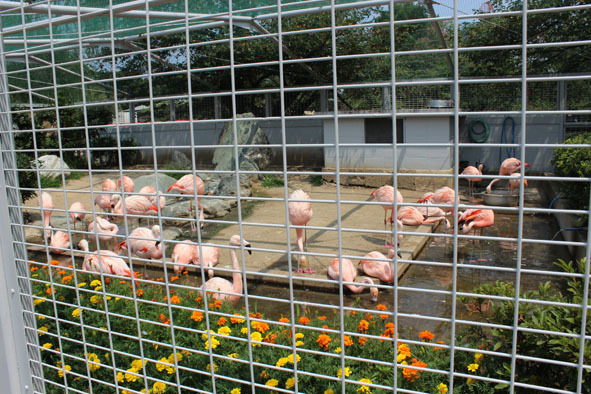 Upon entering the zoo, one of the first exhibits the visitor will see is the Chilean Flamingoes (Phoenicopterus chilensis). 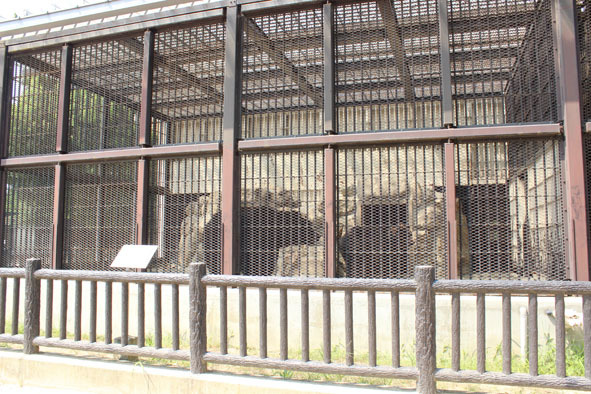 This cage-like enclosure looks to be about 18 meters long by about 8 meters wide and about 2.5 meters tall. 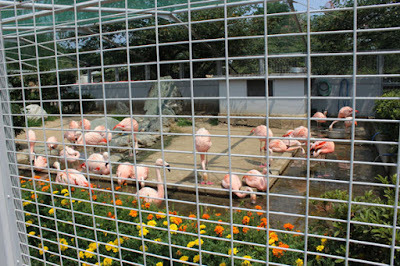 In this enclosure, I counted 30 flamingoes. Although visitors can get very close to the animals (perhaps too close from the animal’s perspective), the enclosure fence becomes an unsightly obstacle when trying to take photographs. Next to the flamingoes is an enclosure holding Red Kangaroos (Macropus rufus). 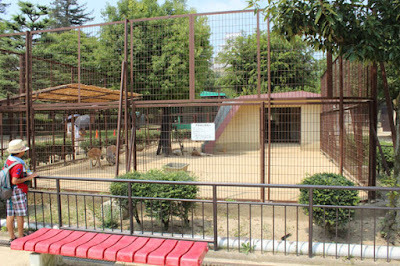 The enclosure is about 8 meters wide by about 15 meters long. 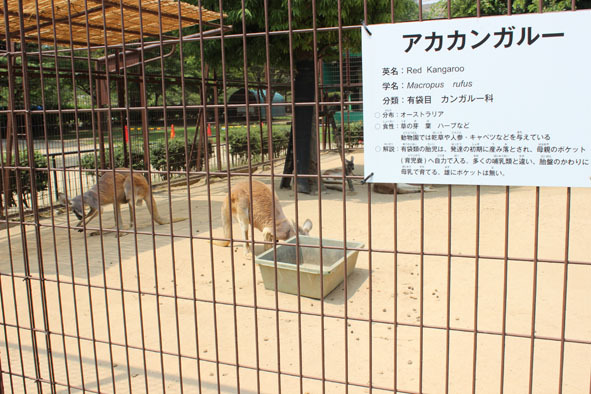 Fortunately, the kangaroos weren’t that big. 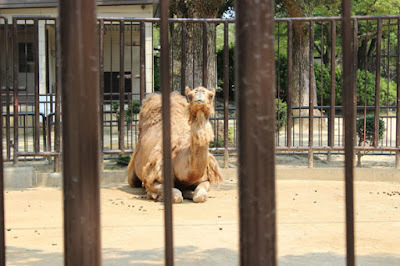 This photo shows the enclosure for the Arabian camel (Camelus dromedarius). 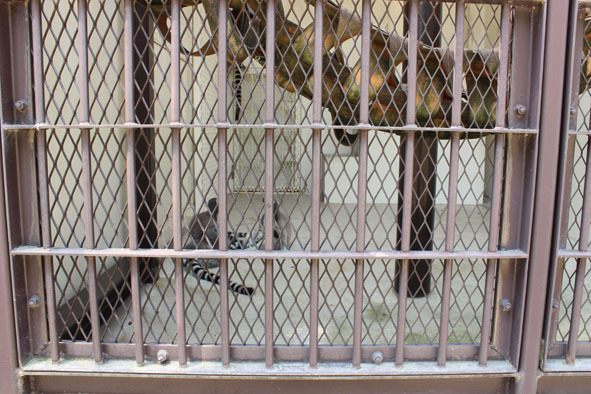 Again, bars get in the way of a good photo. At the Chimpanzee (Pan trogolodytes) enclosure, acrylic panels were installed in front of the cage/bars, perhaps to protect visitors from having the chimpanzees throw food or feces on them. Unfortunately, the reflective properties of the acrylic panels on this very bright summer day made it so difficult to see the chimpanzees inside that I couldn’t even see how many animals there were. 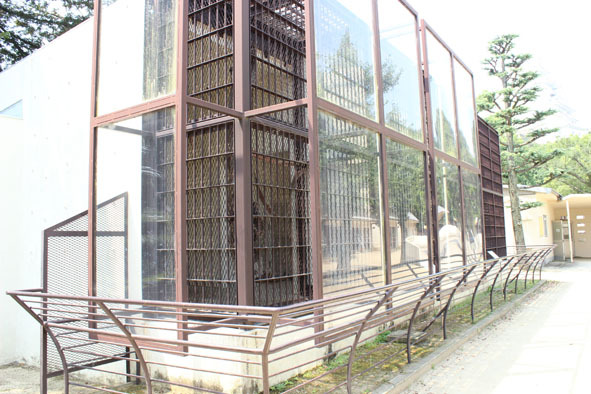 I also imagine that the panels might also prevent fresh breezes from reaching the animals inside. Ring-tailed Lemur (Lemur catta) enclosure. The row of cages below housed small mammals. Japanese badger (Meles meles anakuma) enclosure. This badger had a large bald patch on its back, perhaps from plucking its own fur. 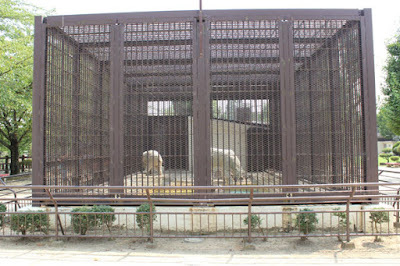 The two large brown bears were hard to see behind the bars and fence. In the bright summer sunlight, they resembled two large shadows. 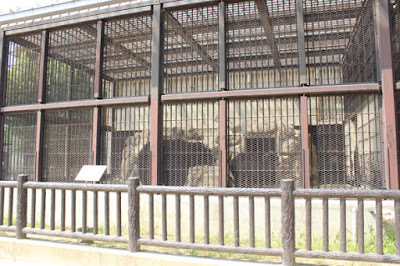 The Polar Bear (Ursus maritimus) enclosure included an outdoor area about 15 meters long by about 8 meters wide connected to two smaller sleeping pens. 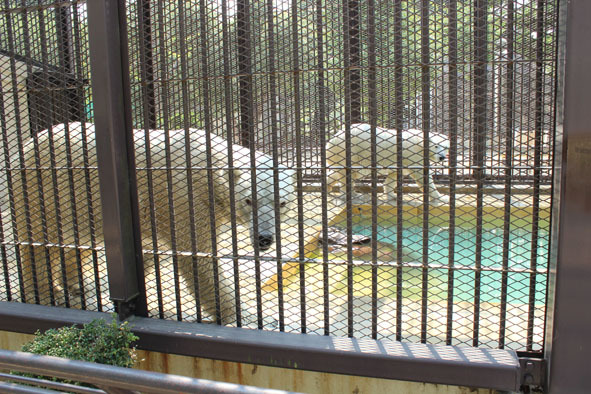 There were two adult polar bears housed in this exhibit, “Yuki”, a 15-year old female, and “Hokuto”, a 14-year old male. 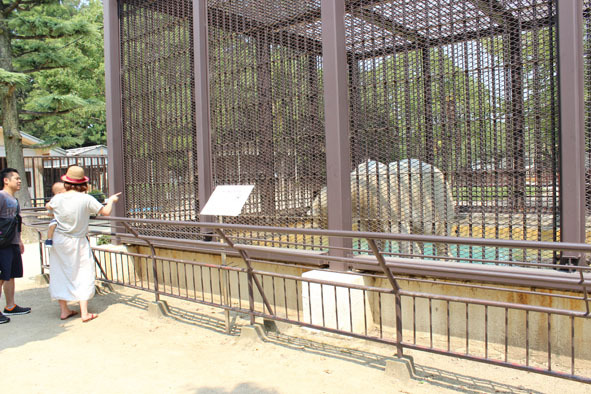 Many visitors would consider the area in this enclosure to be small even if there were only one polar bear. 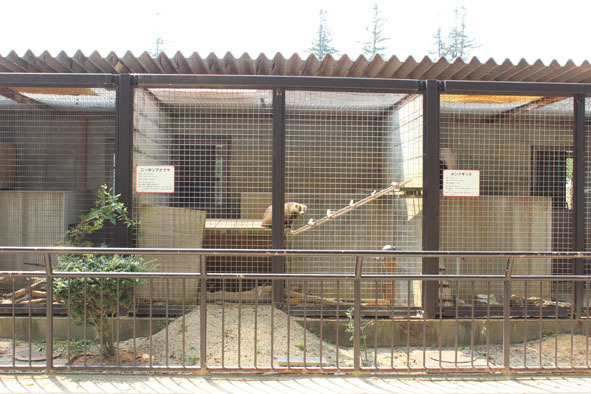 With two polar bears, it appeared to be very, very small. 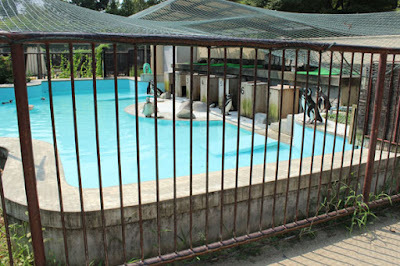 The enclosure featured a pool of water that occupied almost half of the area of the outdoor enclosure. 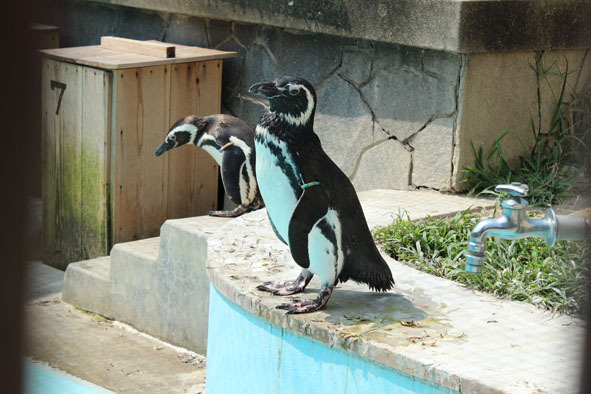 The pool appeared to be about 1 to 2 meters deep. 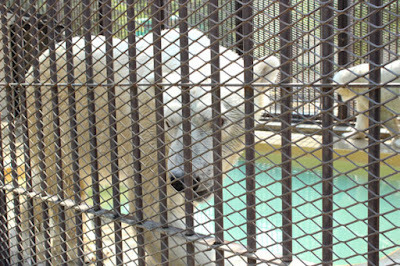 During the hour or so I observed the polar bears, they spent a great deal of time in the water. 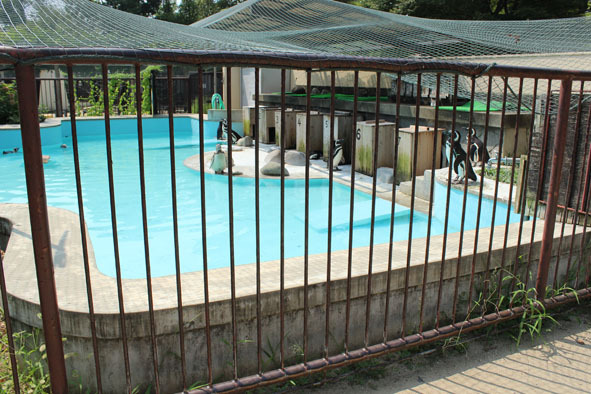 Considering the fact that the temperature that day was announced as exceeding 33 degrees Celsius, and that the enclosure didn’t have a roof to provide shade, diving into the pool was probably the only way to escape the heat. When the polar bears weren’t in the water, they either slept or paced back and forth along the length of this small enclosure. The distance between the polar bears and visitors was only a little more than one meter. 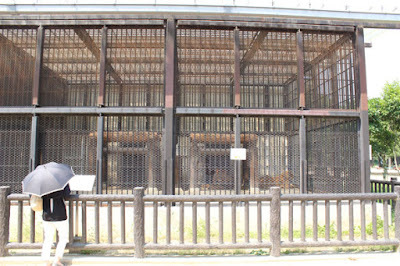 The bars and cage construction of the enclosure provides safety, but it also made it difficult to see the animals and impossible to get a good photograph. Himeji Castle, which can be seen in the background of this photograph, was very beautiful. 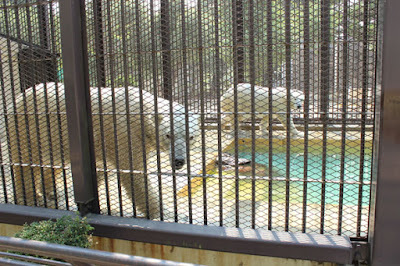 The two polar bears in this exhibit were also beautiful. As for describing the exhibit itself, I don’t think I could use the word “beautiful”. 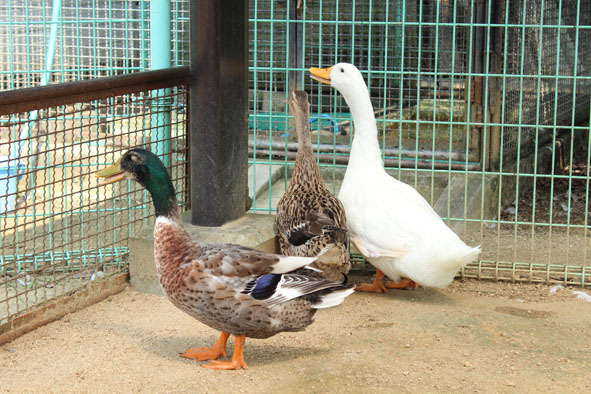 There was a small petting area featuring domesticated animals: rabbits, ducks, sheep, pigs, and guinea pigs. 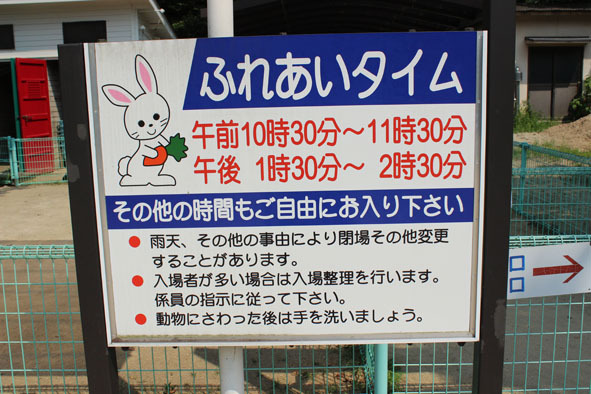 This sign explains that visitors may interact with the animals from 10:30 a.m. to 11:30 a.m. and again from 1:30 p.m. to 2:30 p.m. 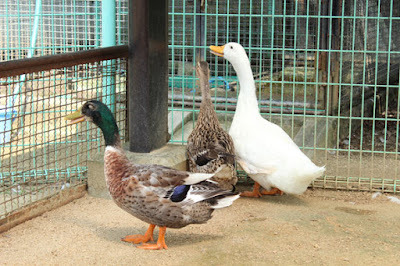 Zoo staff supervised the petting sessions. 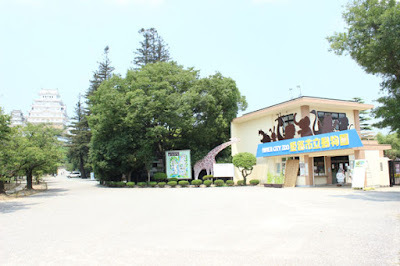 This zoo included a number of rides for small children. 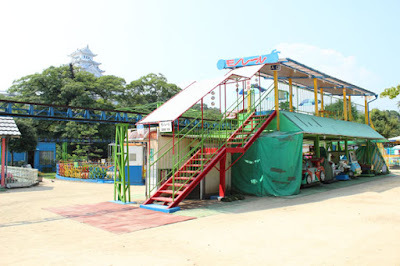 Tickets for the rides were 150 yen. 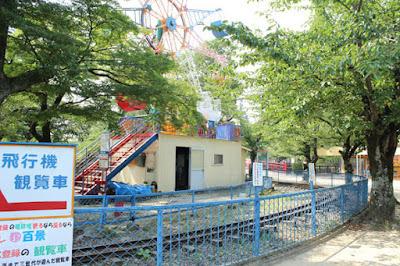 Judging by the design and condition, the machinery of the rides appeared to be decades old. Overall, this zoo appears to be visited mostly by local families with small children. 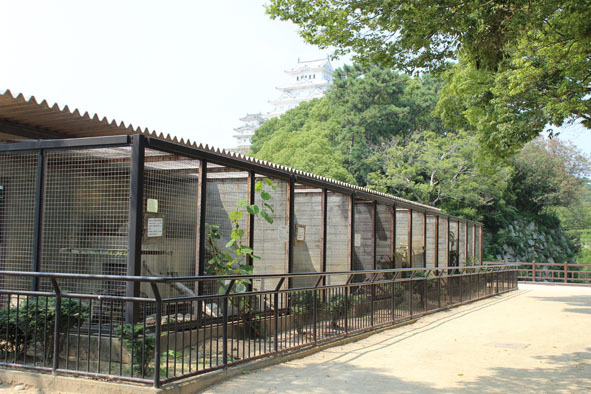 Despite its’ location next to a World Heritage Site, there didn’t appear to be many visitors from other countries. And that may be a blessing in disguise. 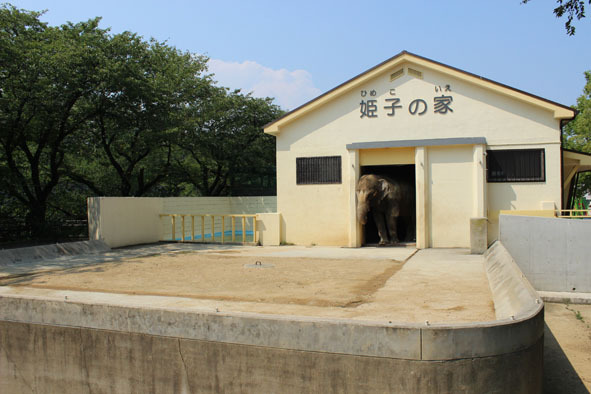 Visitors from countries that have large, wide-open zoos would likely disapprove of the relatively small size of the enclosures and their “cage and concrete” designs. Himeji City Zoo has a land area of about 30,000 square meters (3 hectares), small even when compared to other zoos in Japan. Furthermore, its location immediately next to a world heritage site most likely subjects it to a number of restrictions regarding land use and expansion plans. 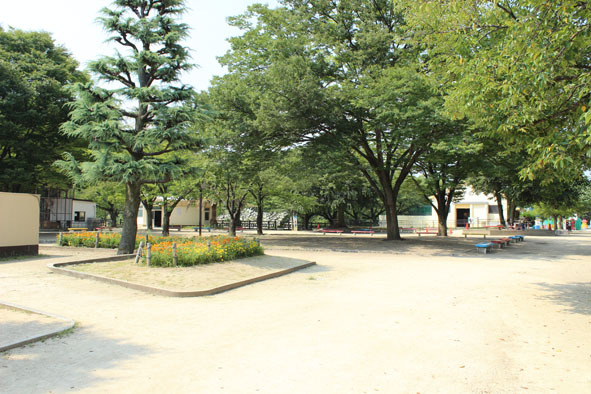 While there isn’t much space, the current grounds are laid out like a park, and there are one or two large open spaces. 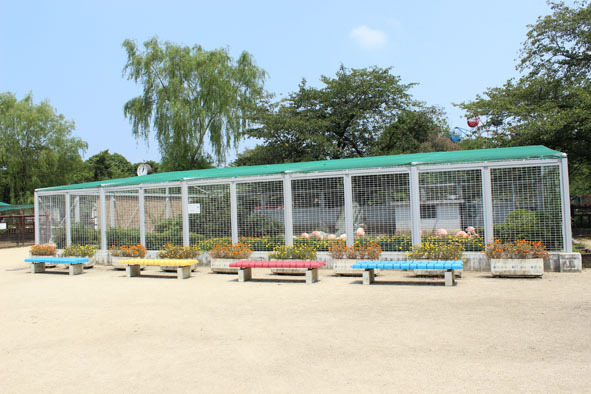 One can’t help but think that a redesign of the zoo, centering on smaller animals native to Japan, and utilizing the land area currently used for the rides and the open space, might result in a much more attractive zoo. 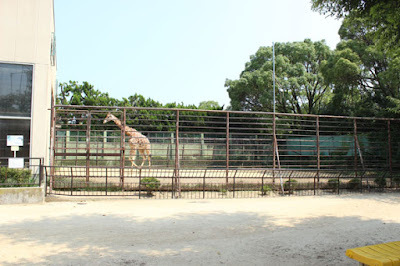 The last time I visited this zoo in 2012, there was a small concession that sold food, drinks and small toys. 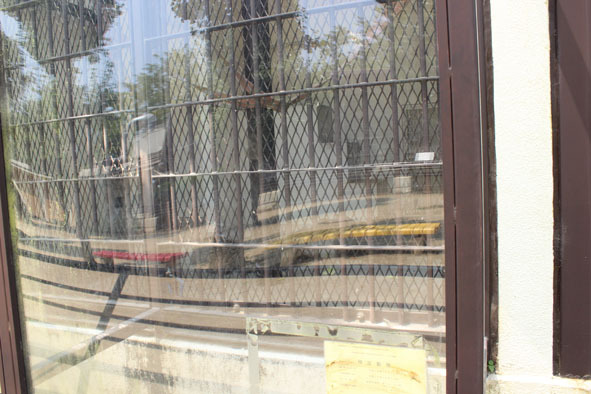 The concession stand is no longer there, and in its place are a few coin-operated vending machines. (Don’t forget to carry coins. There is no place to get change for large bills.) 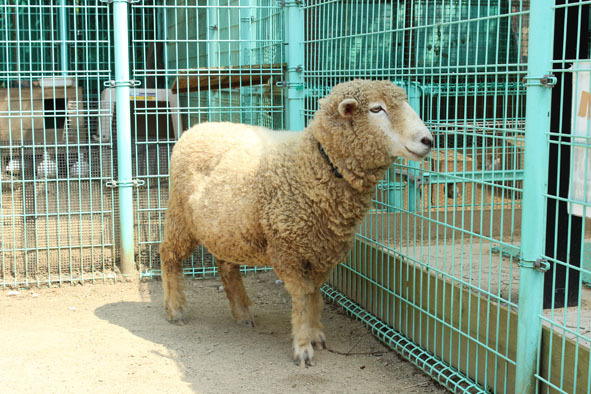 For the souvenir collector, there are no branded zoo souvenirs to be found or bought. The only thing I could take home that had the zoo name was the admission ticket and the zoo map. 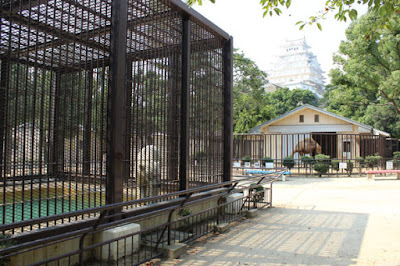 Himeji City Zoo is located immediately next to Himeji Castle. The zoo and castle are about a 15-minute walk from JR Himeji train station, and the castle is easily visible from the train station’s north exit. 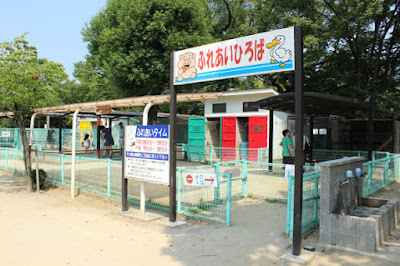 Adult admission to the zoo is 200 yen. 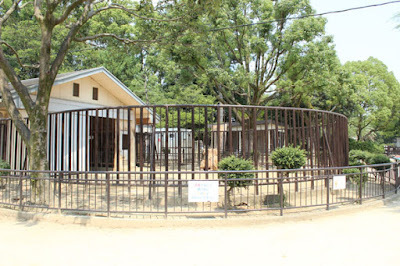 Admission for children from 5 years old up to intermediate school is 30 yen. 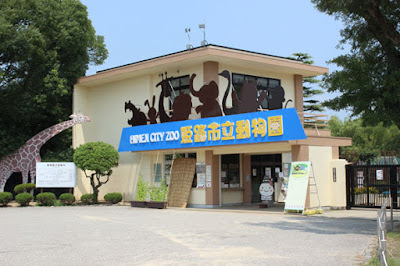 Himeji City Zoo is operated by the City of Himeji, and should not be confused with the privately operated Himeji Central Park and Safari which is located on the city outskirts. This blog is about zoos, aquariums, and animal attractions as seen through the eyes of a tourist.